Like a Dog Returns to its Vomit (No. 1), 2005, Reworked and improved etching from Francisco de Goya's 'Los Caprichos', 44,8 x 37,2 cm. Like a Dog Returns to its Vomit (No. 6), 2005, Reworked and improved etching from Francisco de Goya's 'Los Caprichos', 44,8 x 37,2 cm. Like a Dog Returns to its Vomit (No. 30), 2005, Reworked and improved etching from Francisco de Goya's 'Los Caprichos', 44,8 x 37,2 cm. Like a Dog Returns to its Vomit (No. 13), 2005, Reworked and improved etching from Francisco de Goya's 'Los Caprichos', 44,8 x 37,2 cm. 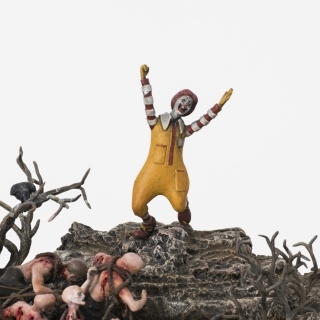 We are delighted to announce the opening of Jake and Dinos Chapman's exhibition Come, Hell or High Water, their first solo exhibition in Scandinavia. 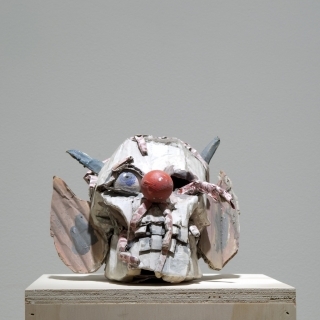 Jake and Dinos Chapman are amongst the most significant British artists working today. 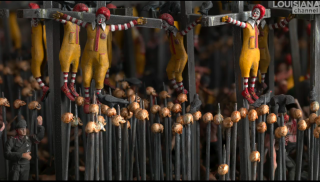 Come, Hell or High Water will present an overview of the artists recent work. Nein! 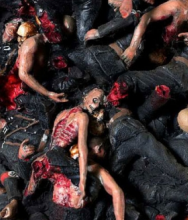 Eleven is a fantastic example of their well known dioramas made up of thousands of tiny, highly detailed nazi corpses lying piled into twin towers of rotting flesh and bone. Come, Hell or High Water will also include original artworks by Hitler, Goya and anonymous Victorian painters which have been reworked and improved by Jake and Dinos. 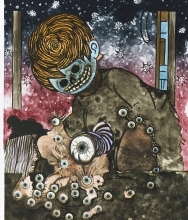 We will also be showing their first lithographs made recently at Edition Copenhagen. 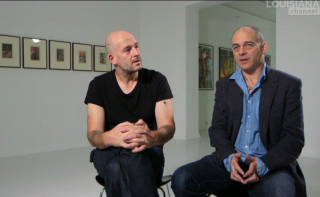 Dinos Chapman (1962, London) and Jake Chapman (1966, Cheltenham) have produced their art collaboratively since 1990. 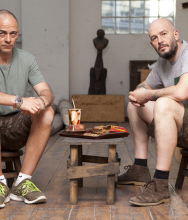 Their have held solo shows at Jerwood Gallery, Hastings, (2014), Serpentine Sackler Gallery, (2013), Pinchuk Art Center, Kiev (2013), The Hermitage, St. Petersburg (2012), Museo Pino Pascali, Polignano a Mare, Italy (2010), Hastings Museum, UK (2009), Kestner Gesellschaft Hannover (2008), Tate Britain, London (2007), Tate Liverpool (2006), Kunsthaus Bregenz (2005), Museum Kunst Palast Düsseldorf (2003), Modern Art Oxford (2003), and PS1 Contemporary Art Center, New York (2000). 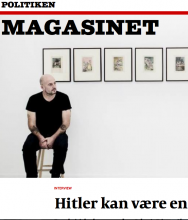 Their works have been included in several group exhibitions including the 1st Kiev International Biennale (2012), the 17th Biennale of Sydney (2010), Meadows Museum, Texas (2010), ‘Rude Britannia’, Tate Britain (2010), Bundeskunsthalle, Bonn (2010), Hareng Saur: Ensor and Contemporary Art, S.M.A.K, Ghent (2010), National Center of Contemporary Art, Moscow (2009), Kunstverein Hamburg (2009), British Museum, London (2009), Palais des Beaux Arts de Lille (2008), Haus der Kunst, Munich (2008), ICA, London (2008), ‘Summer Exhibition’, Annenberg Courtyard, Royal Academy of Arts, London (2007), ARS 06, Museum of Contemporary Art KIASMA, Helsinki (2006) and Turner Prize, Tate Britain (2003), Sensation, Royal Academy, London, (1997), Berlin Hamburger Bahnhof Museum, (1999), Brooklyn Museum, New York, (1999).